Today, Pune’s SWaCH wastepicker cooperative, the Kagad Kach Patra Kashtkari Panchayat (KKPKP) waste-picker trade union and Pune Municipal Corporation (PMC) kicked off a massive, city-wide “Red Dot” campaign to improve the way that residents dispose of their sanitary waste (diapers and sanitary napkins). Waste-picker groups and volunteers are using their creativity to request that people securely wrap their sanitary waste in newspaper and mark it with a red dot. SWaCH is rolling their Red Dot message all across town by stencil painting Red Dot imaging to the sides of SWaCH pushcarts. Keep your eye out for the newly adorned carts, as volunteers and children of waste pickers have already begun painting. Contact SWaCH if you would like to get involved! Today the campaign launched a startling but charming one minute Red Dot video, which is being shared via Whatsapp, Facebook, Twitter, Instagram, Vimeo, YouTube and the SWaCH website (www.swachcoop.com). Visit SWaCH’s Facebook page today to check it out. Tune in to local radio stations to hear interviews with SWaCH and KKPKP members, and get a deeper understanding of the many issues surrounding sanitary waste management. The Red Dot campaign is producing growing array of creative materials to engage Punekars from all walks of life. With Red Dot stickers, posters, t-shirts, mugs, and even mini paper pushcarts all making their way into the public, soon you will no longer be able to avoid the subject of sanitary waste. “SWaCH manages 20 tonnes of unwrapped sanitary waste every day, which is a serious health risk for us. 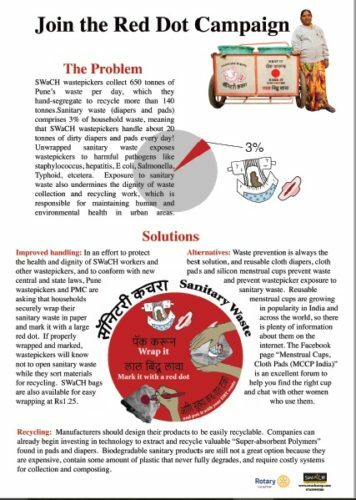 Now it’s time for citizens to take closer look at this problem and show their support by wrapping and marking their sanitary waste,” said SWaCH wastepicker Mangal Gaikwad, who is also featured in the Red Dot video. For easy wrapping of sanitary waste, Red Dot paper bags can be purchased from SWaCH. SWaCH hopes that other businesses will follow suite and also begin providing their own Red Dot bags and educational signs throughout the city. Prepare your sanitary waste for a little more dignity and join the Red Dot campaign! Comments Off on Health and Dignity to Waste pickers & Recylers! Join the Red Dot Campaign!